[FR/EN] A short puzzle game. Transform old memories into new ones ! Escape from the spectrum whithin your dreams. 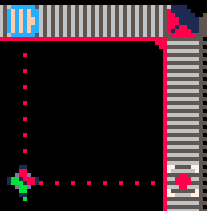 A Pico-8 game. Merci beaucoup pour ce super retour ! Je prévois de travailler sur une version post-jam qui, en plus d'ajouter des niveaux, va complètement changer le feed-back visuel et sonore. -Je pense rajouter des messages "d'erreurs" qui s'affichent quand le joueur essaie de faire une action incorrecte. -Deux blocs ne pourrons plus être sur la même case. Cela devrait rajouter un peu de difficulté et empêcher la confusion avec les blocs fusionnés. -Le tuto sera plus interactif. Le joueur pourra comprendre comment attraper et bouger les blocs avant d'attaquer la fusion et la sortie. C'est bizarre... La touche M déclenche la même action que la touche X, peut-être que cela résoudra le problème ? Je reconnais que le tutoriel n'est pas suffisamment clair. Vous pouvez le compléter sans toucher les touches directionnelles. 1-Appuyez sur Z/C pour prendre les blocs qui sont à droite et en haut. 3-Ensuite, sans bouger, appuyez une nouvelle fois sur X pour envoyez le blocs vers la sortie en bas. Merci d'avoir essayé mon jeu ! Est-ce que le laser vert est aligné avec le bloc et le portail ? C'est très intéressant les jeux pour introduire la programmation. Pour 60H de jam, c'est un beau boulot! L'interface est claire, et ça a dû être un challenge de designer tout ça sur Pico-8! La vitesse de l'exécution du programme est un peu lente à mon goût, mais elle peut être convenable pour un non-initié du code. Je ne veux pas encombrer la description avec une tonne d'instructions car cela pourrait décourager le joueur. J'aurais aimé ajouter un peu plus de contraintes (comme une limite de mouvements) mais cela aurait pris pas mal de temps pour moi ! De plus, il faut déjà comprendre les règles de bases, ce qui (dans cette version du jeu) peut être déjà frustrant pour certaines personnes. Merci, je suis ravi d'entendre ça ! Je suis encore un peu débutant et le temps imposé (ainsi que la fatigue) m'a empêché de faire des tests convenables. Tant mieux si il n'y a pas/peu de bugs gênants ! Right now it appears that we can only set one usage word for a vessel. Will there be a way to add more in the future ? I have been exploring Paradise, and I love it so far! After viewing the Github repository, I realized how easy it is to add an action. So I decided to fork the project and make some experimentation! All of them involve a new little feature: characters ! When you add a greeting message to a vessel, it will become a character. As for the "official parts", this only change the way the name is displayed. But this will also allows you to use the other three new actions ! 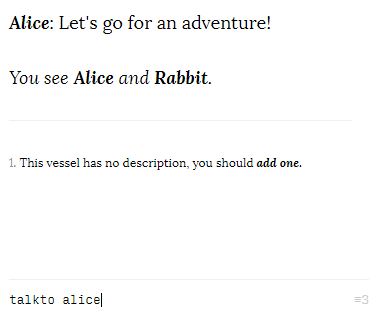 Alice and Rabbit are characters. The first letter of their names is capitalized, and Alice is currently speaking. You can also use the help with command, the documentation is included ! greets Let's make some tea. Set the greetings of the host, which become a character. greets Reset the greeting, the host is no longer a character. talkto Alice Show the greetings of a visible character. answer favorite tea = I really like green tea! Set an answer for the host. Use "=" to separate the question from the answer. answer favorite tea If the answer exist, this will delete it. ask Alice Show the list of the available questions for a visible character (with the greeting). ask Alice favorite tea Show the answer for a question. Alice: I really like green tea! Here is a little tutorial for creating a riddle! greets What is 2 + 2 ? answer 4 = Great! The password is coffee. Q: Wait, how do I run this? I hope you like my mod ! I am still a beginner (expect messy code), but adding those actions was fun and easy! Thank you very much! I always want to throw new stuff at the player nonstop, but it would reduce the potential of existing obstacles... It would be cool if I can make a level editor. In fact, we can hack a level very easily in this code file! It's a great HaxeFlixel game! I was a little confused at first, but the audio part is good (I like the honk) and it's nice to see the colors leaks! Thank you very much! Yume Nikki was indeed a big influence. I even wanted, first, to have a more eerie kind of tone, but this is the rainbow jam, so I decided to make the game more lovely! Wow, that was so relaxing and lovely! I love the low-poly style, and the messages are so sweet <3. Great music... Too bad I can't hear much of it because I keep losing with this walk speed... But the idea is nice! As a REZ lover, I was really happy to play your game! I wish the gameplay evolve later in the game, but for a game jam, it's really good and creative, kudos for the music composition and the little details! A very lovely and fun game! The gameplay can be improved, but the ambiance, the music, and our character are great! The concept looks quite promising (and the guys looks cute...), but like you say in the description, the game is crashing... That would be neat if I can play the rest some days! This is a really cool concept! I like eerie and challenging games like that. I wish there was a little introduction at the beginning, but I want to see a full game with this gameplay! Wow... This was a very well made and relaxing experience! The visuals are really, really cute and fun to interact. I was really deep into the story, and the end was so sweet! We need more games like this, congratulation! Problably one of my favorite game of this jam. It's well made with a great use of the theme and it reminded me of the old adventure games .The first playthrough, the game was softlocked by a bug, but overall it was a very enjoyful experience! Thank you! I like when a game tries to reach everyone, for example with different difficulty settings, but I had just enough time to make only one... So if the difficulty is at your taste, it's good! Thank you! I really glad you love the art because graphic design isn't my speciality! Thank you! I wanted to add more enemies, but the pico-8 engine has a characters number limitation, and I reached the limit way sooner than I thought!